One of the most popular VCP certification paths is the VCP5 – Desktop certification. While VCP5-Datacenter focuses on server virtualization and creating virtual environments for data management, and VCP5-Cloud focuses on the administration of a cloud environment with vCloud director and vSphere, VCP5-DT focuses on end-user computing – working with the VMware View environment, making vSphere environments accessible to end users and ensuring that their clients can tap the full power of the VMware platform. VCP5-DT is an ideal certification for desktop support specialists and user-facing system administrators, since it focuses on the end-user. Professionals with this designation have not only shown the ability to effectively administrate VMware View to end-users, but also have a strong understanding of vSphere and VMware core components as related to networking, storage, and datacenter management. VCP5-DT provides a great introduction to working with client-facing VMware solutions. The VMware Desktop certification track runs all the way up to the Design Expert level, which focuses on delivering mobile and desktop solutions with Horizon Suite. If you’re looking to jump into the world of desktop virtualization and already have some experience working at the desktop level, then VCP5-DT is the place to start. There’s also a VMware Associate Desktop exam for those who are just being introduced to these methodologies. If you’re looking to earn either of these valuable certifications and get started on your path to a great virtualization career, VMware Certification has several ways to help. 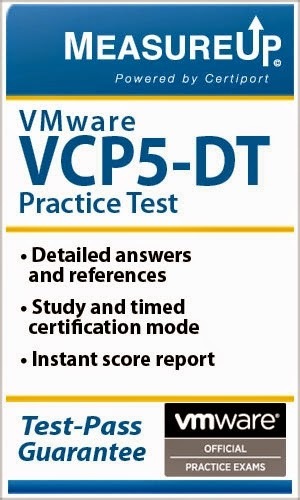 For the first step in preparing for the VCP5-DT exam, we recommend the VCP5-DT Official Cert Guide, which includes a textbook, e-book, and basic practice exams. 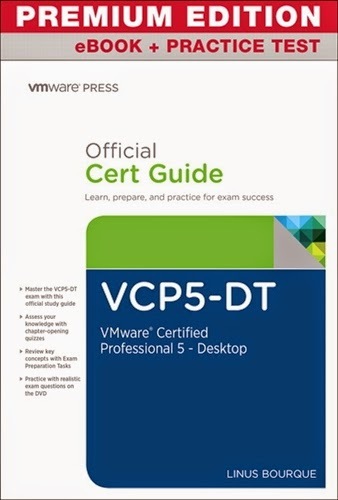 This VCP5 study guide is the only guide officially endorsed by VMware, covering all the topics that are included in the VCP5-DT certification. Not only does it cover all the information you need for exam success, but it also makes it easy to prepare for the exam. This guide features “Do I Know This Already” lists before each chapter, so you can choose which sections to spend more time on than others, and end-chapter review exams to ensure you understand each topic before moving on. When you’re almost ready to take the exam, the Official VMware Certified Professional Desktop (VCP5-DT) Practice Test by MeasureUp helps validate that you’ve mastered the content. MeasureUp is one of the leading names in IT test preparation, and they’ve paired with VMware’s experts to create one of the most thorough, effective VCP5 practice exam options currently on the market. MeasureUp is so confident that their guide will help IT professionals in their quest for the VCP5-DT certification, that they even include a Test-Pass Guarantee! VMware Certification Marketplace offers everything you need to earn your VMware certification, from guides on topics ranging from virtualization basics to enterprise-scale datacenter management. Visit us today to get on your path to a great career in the growing world of virtualization!